I caught this movie recently, after a friend of mine “highly” recommended it to me … and I’m glad that I caught it. This is one more addition to African Centric movies – though this is of a different nature. The last african centric movie that I had watched was Hotel Rwanda, which to be frank, was brilliant. These movies paint a very sad picture of Africa, and honestly, even India, with the gzillion problems that we face everyday, seems like heaven compared to what some people out there go through. 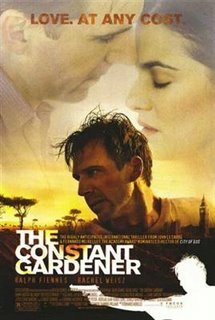 Some parts of Africa, are really, really bad – which results in the more well to do countries treating them like expendable guinea pigs – a premise on which the Constant Gardener is based on. I’ve heard that the promos of the movie are very misleading and you’ll be better if you’ve missed them completely – and if you have not, don’t go according to what they say. But a movie very well worth watching for its underlying base. BTW .. the movie has Rachel Weisz (Mummy, Runaway Jury) who is brilliant and won the best supporting actress for her role in the movie. Also has Ralph Fiennes (Schlinders List, Maid in Manhattan, The Prince of Egypt) who is equally brilliant. The movie is one of the better movies made last year and Rachel Weisz, besides being a treat to the eyes, has done a great job for which she won the best actress at the Oscars last week. You might want to read a review of the book ( The Constant Gardener) by John LeCarre posted on my blog sometime in Aug/Sep 2005. The novel has a neater plot even though it dragged a bit in the middle. The locale of the story gives the movie an advantage over the novel. Really good movies are treat for eyes,sady we do not have that much a good stuff in india now.Some films like R.D.B do make a mark.But we still have majority of them beating about same bush.